This was an easy pick-up for Cinderella week - it's right there in the title! The stepmother and evil stepsisters trope is alive and well. For some reason Callie refers to the Whitakers as Ma and Pa as well as thinking of them as her stepparents, though in reality they're closer to adopted parents. Certainly, they treat her like a servant at best. Callie's very beaten down, seeing herself as a nobody because of what her 'family' has taught her. While Pa exists as a distant authoritarian figure, Ma and the two stepsisters, Nellie and Lydia, are a constant pressure on Callie to see her chores done and to remember her place. We do get the makeover and ball (in the form of the nightly dances held by the wagon train), though the latter doesn't have the significance that it does in the fairy tale. They do help Callie see herself as more attractive than she realized she was and help expose her to new people who in turn treat her better than her family ever has. The romance with a prince is converted here into an awareness of the man hired to help guide the wagon train. While there is a prince of sorts in Magnus Ferguson, the leader of the train, Callie's interest is always in the mysterious, aloof Luke. I think I'd call this one inspired by Cinderella. It's not a faithful adaptation, and the story focuses more on the trials and tribulations of the wagon train's journey than it does on the romantic fairy tale aspects. I'm going to rate this one 2 of 5 Glass Slippers. Now, there's some really good stuff in this book. The hardships of wagon trains during the mid-nineteenth century are very well related in this book. If you like pioneer stories, this book might appeal. We see the dangers of the travel itself - weather, quicksand, river crossings, mountainous terrain, food shortages, rough weather, illness, the danger of other people (Indians, other travelers, people in the same wagon train), and so on. There are so many difficulties that I was filled with respect for people who attempted the journey at all, let alone those who were able to soldier through and survive it. Unfortunately, I think that Wagon Train Cinderella falls a little short when it comes to the writing quality overall. I found it a bit flat, making it hard to connect with the story. There's a lot of time spent reflecting on the way things are when I'd have preferred a little more action. For example, we know that Callie has to do much of the work around camp, but we don't see her actually doing much of it (other than cooking). We know that Callie's very conflicted about standing up to her family, but it really doesn't take much to push her in that direction - Luke saying she should is pretty much it. The romance was right on the cusp of working for me. I needed to see Luke and Callie connecting a bit more to really buy into it. Luke's so critical to Callie's growth but other than popping in periodically to give her a nudge in the right direction, I felt like we missed out on some critical interaction between the two. The romance is also really background to the greater revelation of Callie's personal growth, and the journey itself. 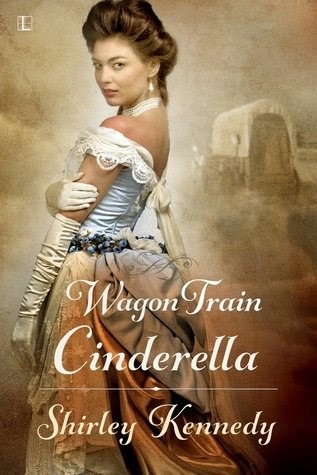 Wagon Train Cinderella is more historical fiction than historical romance as it is far more successful as recalling the dangers of the wagon trains than at weaving the fairy-tale-esque romance I was expecting. Unfortunately, I wasn't charmed by this one.